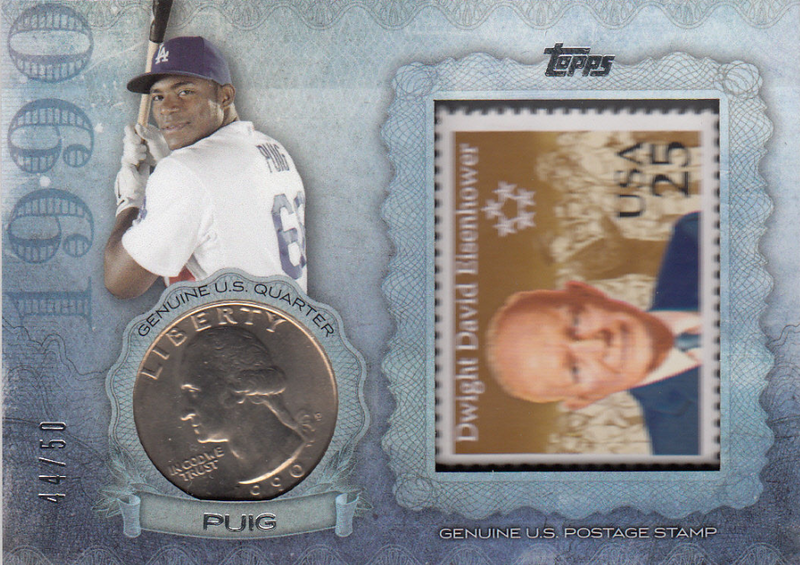 Here's a look at some of the Dodger insert cards within 2015 Topps Series 1. 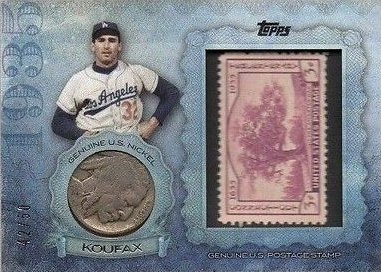 Featured below are the Birth Year Coin and Stamp, Career High and First Home Run insert, relic, autograph and medallion cards. Of note, there are cards of Paul Konerko and Mike Piazza in Dodger Blue. WooHoo! 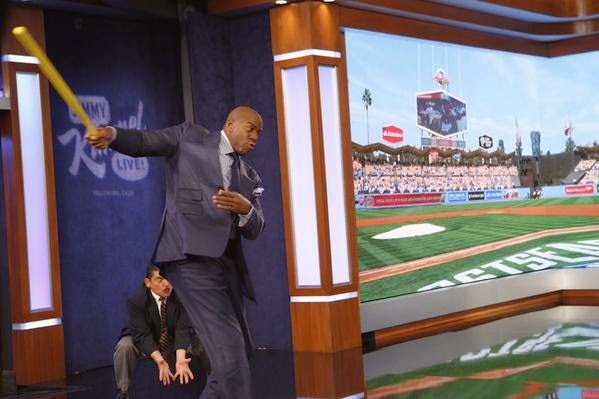 Dodger owner Magic Johnson visited with Jimmy Kimmel last night and chatted a bit about the Dodgers. 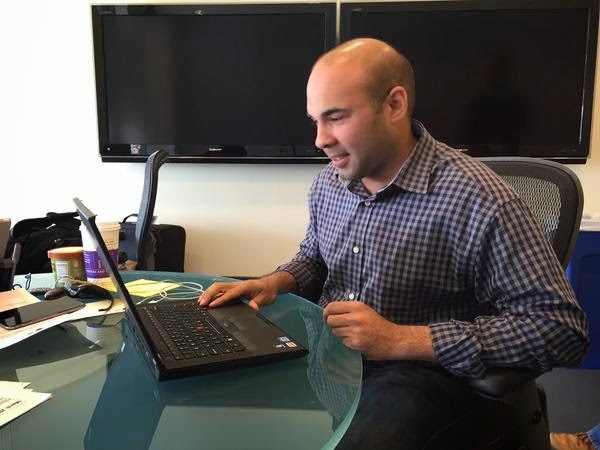 As you may know, Magic is an proactive entrepreneur; oftentimes learning every task of a business that he owns. This can include learning to cook at his restaurant to running a projector at his movie theater. Naturally, Jimmy wanted to know if owning the Dodgers means that he has learned how to play ball, and as we soon find out Baseball is not Magic's forte. 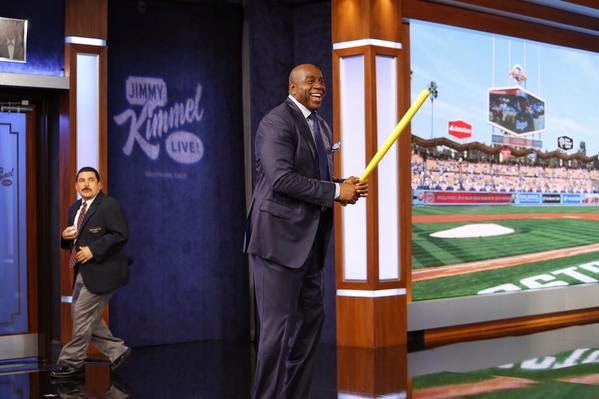 Watch the video below of Jimmy Kimmel throwing wiffleballs at Magic. As Magic confessed, he can't hit worth a lick. Here's an outstanding 1952 International News press photo of Jackie Robinson stealing home on Cubs catcher John Pramesa that I ran into on eBay. Check out the auction here. It was the bottom of the 4th inning with Cubs pitcher Willie Ramsdell on the mound. Starting pitcher Preacher Roe was at the plate with the bases loaded, two outs and the Dodgers with the 1 run lead. Tension was mounting as the 1st place Dodgers sought to run the pitcher out of the game. On a 3-1 count Jackie headed for home and beat the called strike for the Dodgers 3rd run of the game. Via Cary Osborne at Dodger Insider, "‘Dude, smile': An introduction to Enrique ‘Kiké’ Hernandez." Here's a fun look at one of our newest Dodgers. Cary Osborne also writes, "Chris Hatcher: From curiosity to shutdown reliever." “There are three things that come out of my mind and my mouth before I come out of the bullpen: confidence, trust and conviction,” Hatcher said. “I want them to be the last thing on my mind before I come out of the bullpen. Because if you go out and have those three, more than likely you’ll be allright. Via David Young at True Blue LA, "The rarity of switch-hitting Dodgers catchers." Via Nadia Tseng at Dodgers Nation, "Kenley Jansen Takes Criticism of Dodgers Bullpen Personally." Holy Moly! Check this thing out. While perusing through reddit I ran into a post by ryanjovian on the r/Dodgers reddit and was immediately envious of what I saw. 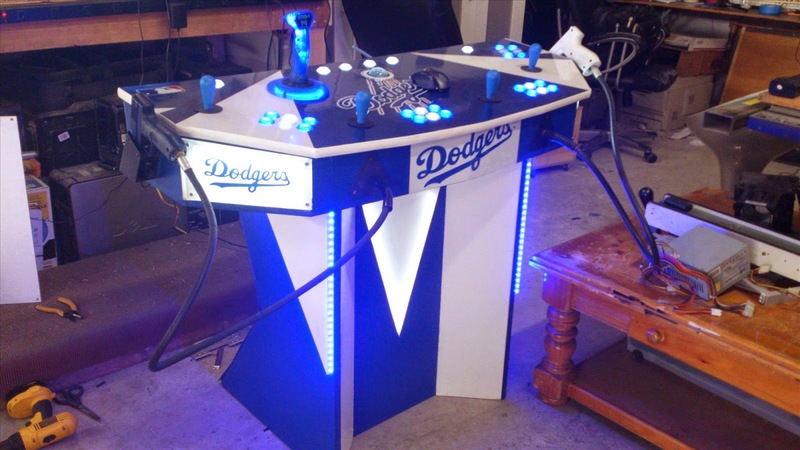 He links to a group of photos of an enterprising gamer who made a Dodger themed arcade pedestal for the home, at Arcade86. Go here to check that out. It includes 42 gaming consoles and over 80,000 video games. Wha....! I see a Tron joystick.